We’re all familiar with reduce, reuse, and recycle. Now, communities are having to rethink waste management, too. As many households in St. Albert know by now, the contents of their blue recycling bags are much reduced. Gone are glass containers, some types of plastic packaging, clamshells, single-serve cups, non-deposit tetra packs, and other plastic and paper waste. 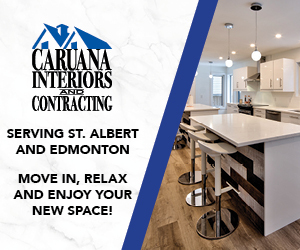 The new rules, which took effect in November 2018, caused some initial confusion and consternation, which was shared across central Alberta and beyond. But this could be just the start of things to come, as communities such as St. Albert grapple with the environmental and financial costs of waste. The new recycling rules in St. Albert and elsewhere are a response to policy changes halfway around the world. In early 2018, China implemented restrictions on recycling imports through its National Sword policy. With a single stroke, the world’s largest importer of recyclables banned the import of a wide range of plastic and paper for recycling, as well as unsorted mixed loads of different kinds of plastic and paper. Additionally, China has imposed stricter limits on the amount of contamination allowed—food scraps and other non-recyclable waste that get mixed in with recycling. For the Chinese, it was just one of several recent initiatives designed to make their country greener and cleaner. For us, it means we now have to do a much better job of sorting our garbage and recycling. The move, which was announced July 2017, has left the recycling industry in North America scrambling and has rippled through the recycling supply chain, all the way down to the local level. While Materials Recovery Facilities (MRFs) have hired more staff and slowed conveyor belts to improve the sorting process, communities like St. Albert have little choice but to pass on some responsibility to residents. Early in November, the new restrictions led to a number of blue bags being stickered and left at the curb. But with the assistance of the City, its website, and the Be Waste Wise app, Kwok says, residents have largely been able to adapt. For the sake of efficiency, the initial stickers were colourful but non-descriptive, as collection workers didn’t have time to explain why bags were rejected. But soon, we can expect to see new stickers with checkboxes indicating problematic contents to help further ease residents into a new way of recycling. Whatever confusion St. Albertans have experienced, it’s been felt elsewhere, too. With contractors like GFL Environmental no longer accepting items that can’t be sold locally or exported, many municipalities have had little choice but to fall in line. 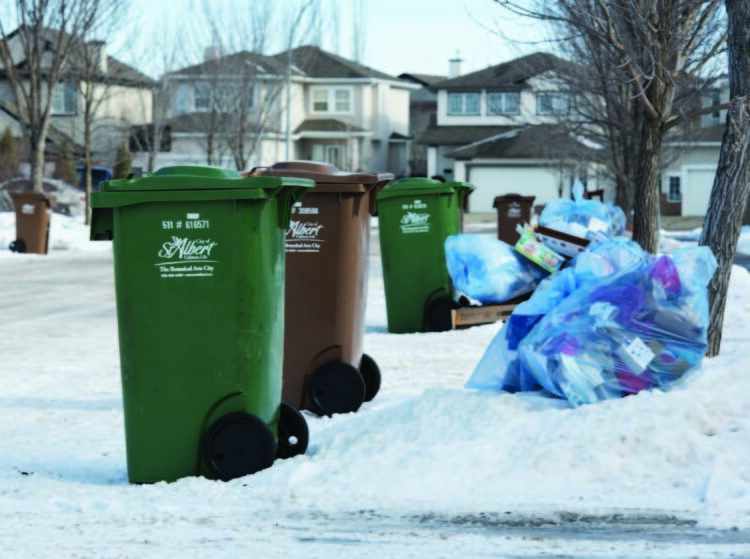 And so the blue bags and brown and green carts lining St. Albert streets on collection days are similar to what residents are now putting out in Fort Saskatchewan, Strathcona County, Leduc, Spruce Grove, and other municipalities. And like St. Albert, those communities have made necessary changes in the past year to what can and can’t go into the recycling bag. “They have adjusted their programs as well, to ensure that items put into blue bags can be recycled,” Kwok explains. 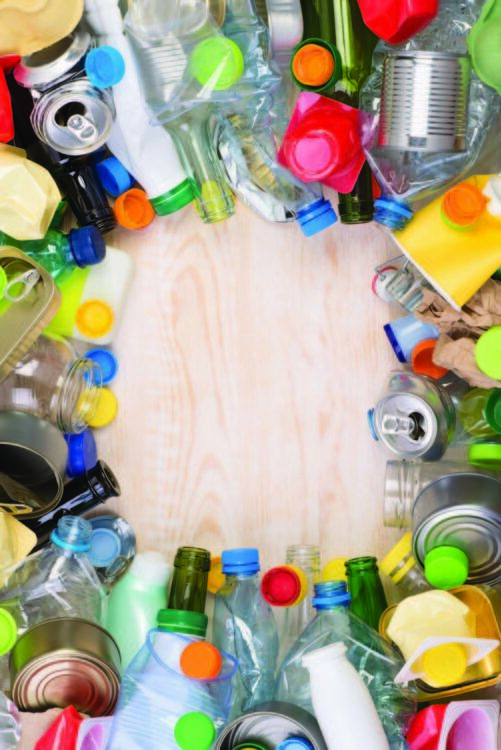 In Edmonton, at least for now, households are not asked to sort waste, and items that are banned elsewhere—such as glass jars and plastic clamshell containers—are still accepted. But in Edmonton and elsewhere, the goal remains to divert as much as possible—namely organics and recyclables—from the landfill. 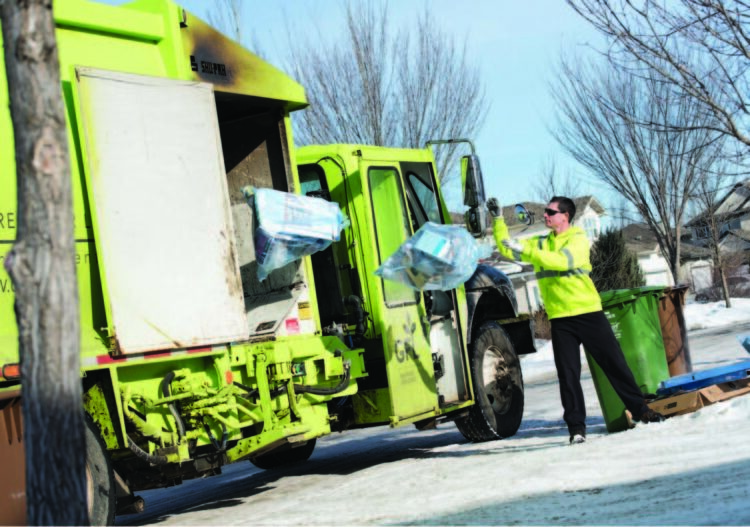 The capital is currently wrapping up its second phase of public consultations on the future of its waste collection, which will likely lead to changes as the city strives to meet its goal of diverting 90 percent of residential waste from landfill. Its current diversion rate typically hovers around 50 percent. But in 2017, this number had dropped to 44 percent with the temporary closure of the city’s compost facility due to structural issues. For a time, this meant that organics were being diverted right back into garbage and local landfills. As such, waste diversion has become something of a mantra in urban waste collection. Landfills aren’t exactly attractive places, and when filled with decomposing organic waste, they can emit a considerable amount of methane and other greenhouse gases. Also, while built-to-standard landfills have systems in place to manage leachate (liquid that has passed through decomposing or hazardous waste) and stormwater runoff, the potential is still there for contamination of surface and ground water. Just ask the Town of Whitecourt, which was charged by the province in September 2018 for allegedly breaking a number of environmental rules at its municipal landfill, including the unauthorized release of runoff. Further pollution and contamination can occur during waste transportation, either through small leaks or traffic accidents. Then there’s the expense of landfills in terms of construction and operation, loss of other land-use opportunities, and later, the reclamation and remediation of the land, which continues for decades after a landfill has closed. As a result, like Edmonton, many cities have diversion targets in place. The target for St. Albert is 75 percent diversion by 2020, a goal that was set in the 2014 Environmental Master Plan. This came after the City met its previous goal of 65 percent in 2012. Unfortunately, the residential diversion rate seems to have stalled, even dipping to 64 percent in 2017. But Kwok points out that these figures can be a little misleading. Waste streams are measured by weight, and even 10 or 15 years ago, packaging was heavier than it is today, possibly giving the appearance that less material is being recycled these days. In relative terms, though, St. Albert isn’t doing too bad when it comes to residential waste diversion. In fact, it has one of the highest rates in the province. Christina Seidel, executive director of the Recycling Council of Alberta, names Strathcona County and St. Albert as two municipalities that are doing it right. While the former’s Green Routine program has an excellent educational component, St. Albert’s success lies more in its financial incentive. Residential waste is just one part of the puzzle. And according to Seidel, it only accounts for one quarter of the waste we generate—with the rest coming from the Industrial, Commercial, and Institutional (ICI) sector. It’s a problem that governments in Alberta haven’t really tackled yet. And it’s a big reason why this province lags behind the rest of the country when it comes to waste. Not only did we generate the most waste per capita in 2014—981 kilograms—our total diversion rate that year was the lowest among the provinces at just over 16 percent. In St. Albert, waste collection at the moment is strictly residential, with no bylaws or policies in place for the commercial sector. “Businesses are either voluntarily managing waste reduction programs, or they recycle on their own. Right now, there is no mandatory program.”, notes Kwok. Province-wide, this approach appears to be the rule more than the exception. On the face of it there is nothing stopping cities and towns from getting serious about recycling and diverting commercial waste. This could be done either through bylaws or through softer approaches, such as programs that encourage and assist businesses. “What we’ve found is that businesses are generally supportive and interested in doing these things,” Seidel says. “[But] it’s not their core business, so they don’t necessarily know how to do it.” Both Kwok and Seidel cite Calgary as a leader in this regard. The province’s largest city has mandatory recycling rules in effect for businesses, as well as residential apartments and condos. But Seidel believes the responsibility shouldn’t fall entirely on local government. She argues that the province also has a crucial role to play, and has largely fallen short. Besides banning certain materials from landfills, they could also set serious goals and lead by example. “There’s so much that the province could be doing,” Seidel says. Ultimately, though, all the attention given to waste diversion and recycling possibly obscures the real problem—the enormous amount of waste we create. Obviously, diversion is important, even necessary. But diversion doesn’t mean permanent. What’s recycled today may very well end up in the landfill tomorrow in a different form. In the waste hierarchy—commonly depicted as a pyramid, with disposal at the bottom as the least favoured action for dealing with waste—diversion is in the middle. The best way to deal with waste, in fact, is not to generate it in the first place. It may require some significant changes in our purchasing and consumption habits, but there are many benefits of waste reduction and prevention: less pollution, less demand on natural resources, and less money spent on consumer goods and waste management programs. Renovations – Good for Resale? ?